Get Huge Savings on your custom t-shirts right now! 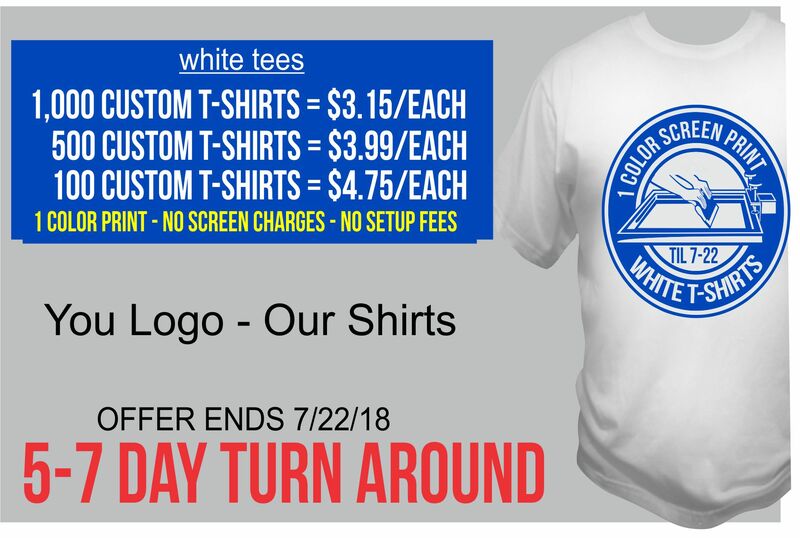 Right now we are offering huge savings on white t-shirts custom printed with your logo in 5-7 business days. Step 3: Once invoice is paid we will provide you with a digital proof to approve before we print. Step 4: Once you approve your digital proof…we print! * Pricing is for adult small – Adult XL. Add $2.50 per shirt for XXL sizes. Add $3.50 per shirt for XXXL sizes. *** NO Screen Charges – NO Setup Fees – Tax if applicable is not included and any shipping cost is not included in the per shirt price. 5-7 Business day turn around from date digital proof is approved.